The Mazda MX5 Miata is one of the most widely loved cars in the world, and it is loved by the masses. Chris Harris, a journalist from the UK whom I greatly respect, wrote his thoughts on the Miata in a recent article (link at bottom). In it he deeply criticizes the car and even goes so far as to say it is not a real sports car. Now, having myself recently just bought an old ’93 Miata off of a friend, I can relate to what Mr. Harris is talking about in some regards, but in others I have to disagree. Now before going any further we must realize that Chris Harris is not the Miata’s target demographic at all. He is at the peak of automotive journalism, and gets to drive all of the great cars of the world for a living. He can probably be considered one of the most discerning people in the world when it comes to automobiles. The Miata was not marketed for such people. It is aimed at the average person with an average life who drives average cars on a normal basis. 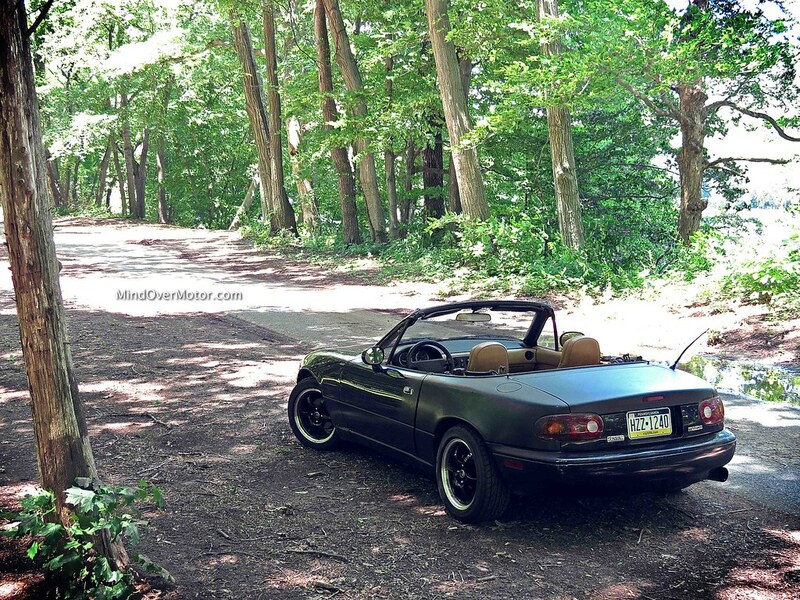 To such a normal person, a Miata will feel extremely sporting and engaging to drive, and they will have an utter blast with it because they don’t know anything better and most don’t care to. Now, I being an automotive enthusiast and increasingly discerning driver myself, would have to say that I see where Mr. Harris here is coming from, but that I believe he is missing the point of the MX5 from an enthusiasts standpoint. Yes, from the factory the car has a rather mush suspension, tends to understeer at the limit. It has more disengaged steering than other cars you could compare it to, and yes, it is ungodly slow. While most of these flaws would not be recognized by normal folks, enthusiasts do tend to notice them. I would never say the MX5 is not a sports car though, not by a long shot, as I had a blast with the car. While the car is fun as is, for real enthusiasts to get what they want out of the MX5, it needs to be modified, and it seems Mr. Harris’ mistake was in not taking modifications into account in his article. It is incredible the difference that just putting in a better front sway bar makes for the car’s dynamics, let alone better shocks and springs. My car had all of this done at once as well as wider wheels and tires, and when I got it back it was like an entirely new car to drive, much improved. And all of the usual power modifications are available if you want it to be faster (LS1 swap anyone?). But any car can be modified so what makes the miata so special? It’s the mix of availability of cars and parts along with the fact that all of it is so damn cheap. If you want a track toy on a budget, the MX5 is pretty much the best bet, as can be seen by how many are used for such a purpose. That is what makes the MX5 so good from an enthusiast’s standpoint. Now, in his article, Mr. Harris compares the MX5 to a Lotus Elise. I know they have been around in the UK for a lot longer than they have here in the US and with a wider model range, so maybe there they are comparable. Here in the states though, they could not possibly be compared because of price alone. You can buy an early MX5 for as low as a grand or two, whereas the Elise bottoms out around $20,000 even for the earliest models offered here. In conclusion, I do agree with much of what Mr. Harris said about the MX5 in stock form. It is rather dull for anyone who has driven a lot of sports cars. But he failed to acknowledge the fact that most enthusiasts will in fact tinker with and modify their cars to their liking, especially if they use their cars for track events. That is where the brilliance of the MX5 lies for the enthusiast, and that is what he either missed or omitted from his article on the car.